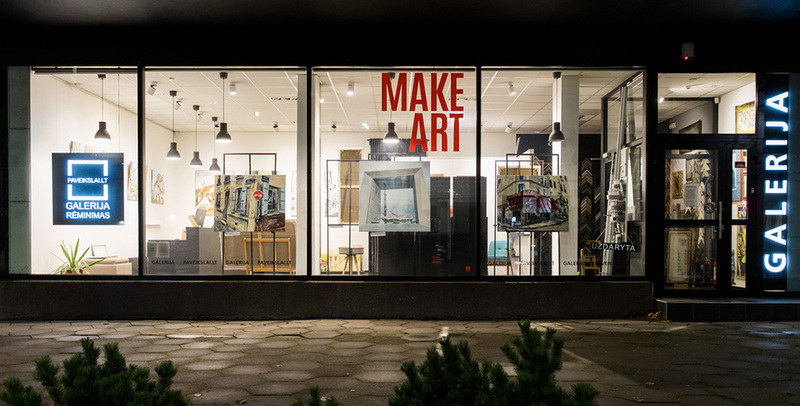 We have two physical galleries in Vilnius and Kaunas, Lithuania. You can see some of the paintings there. We are also offering framing service. All our contacts are below. Here you can see some of the paintings and frame them! All our paintings are one of a kind, so if you want to see a particular painting, please arrange it on the phone. City parking nearby, zone Yellow (G). ATTENTION! We have moved to a new and better location. New address is POLOCKO 1 in Vilnius, Užupis. See you there! There are thousands of great artists. Those who are not yet discovered and those who are well known stars, their works are bought for thousands of dollars. We seek to make the unknown to become famous and to help you buy the works from the established ones for reasonable or worthy price. With no in-betweens, with no hundreds of percents usual mark-ups added by galleries, and without ever leaving your house. 1. To help paintings find their buyers. 2. To find, help and rise new talents. 3. To help artists to earn money from their art. 4. To popularize Lithuanian and other Baltic artists abroad. 5. To develop our customers' taste in art and help to choose from the best offer. Remember: www.paveikslai.lt sells only original paintings – here you will NOT find any reproductions or copies. The authenticity of each work is guaranteed with Certificate of Authenticity.